Recently, the First International Forum on Institutional Research was held at Peking University (PKU), welcoming eminent experts and scholars from more than 20 universities and research institutes. The academics, who had gathered in Beijing from across the globe, met to discuss the analysis and application of research data, while sharing helpful research experience that they had gained throughout their careers. LinkedIn, the world's leading professional network, was invited to attend the forum, and released data and an analysis of the current employment status and trends of college graduates. 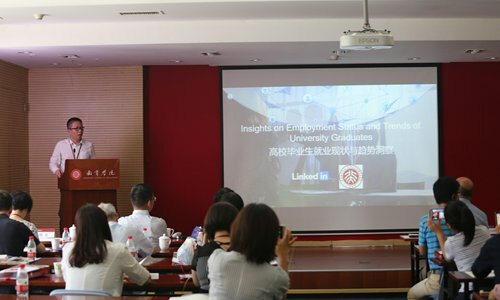 LinkedIn's Economic Graph Project offered an insight into China's higher education sector from the vantage point of talent demand. This will help to explore and evaluate the effects that higher education has on the skill development of Chinese college students. In recent years, the construction of world-class universities and first-class discipline has attracted much attention. In October 2017, the "Double-First Class" initiative was included in the report of the 19th National Congress of the Communist Party of China. As the primary provider of quality talent, China's higher education sector drives the nation's economic development and social progress. Digital skills are popular, with great demand for tech talent. Half of the top 10 employers that most PKU graduates join are high-tech companies, and the top 5 tech skills of PKU graduates are proficiency in: data analysis, C++, Python, C and Java. This confirms that the market continues to have strong demand for high-tech talent and relevant digital skills and illustrates that PKU has caught up with the increasing appeal of tech degrees. Higher degrees give people flexibility in career choices. LinkedIn's collection of big data also revealed that PKU graduates have a strong desire to pursue further studies. Statistics show that: 39 percent of PKU graduates hold bachelor's degrees; 47 percent hold master's degrees; and 15 percent have a PhD. Compared with other "Double-First Class" universities, PKU has 11 percent more graduates who have either a master's degree or PhD. The finance industry continues to attract talent. The top 5 most popular industries among Chinese college graduates are: software & IT, manufacturing, finance, corporate services, and hardware and networking. During 2013-17, a number of industries saw rapid development, including the accounting, financial analysis, public relations, communication and marketing sectors in the mass market and; the business analysis, digital marketing, corporate finance, logistical management and financial accounting sectors in the niche market. Emerging industries are growing rapidly. Broadly speaking, the following majors are the most in-demand degrees amongst employers: in the mass market, entrepreneurship, financial mathematics, banking and financial support, computer software engineering and language translation are highly thought of; whereas in the niche market, international and comparative education, linguistic, comparative and language, business communication, educational leadership and administration, and applied economics are the especially common degrees on a resume. Emerging industries tend to favor graduates who have finance and/or language degrees. Furthermore, LinkedIn has found that the top 5 skills that improve hiring potential are proficiency in Hadoop, PHP, MySQL, machine learning and algorithms - all of which are digital skills. Wang Yanping, head of Public Policy and Government Affairs at LinkedIn China, remarked, "In response to national policy requirements, LinkedIn will help 'Double-First Class' universities play a more active and leading role by providing research results that will influence more universities across China to foster core talent from the starting point of the curriculum. Offering an insight into talent trends and skill demand, with a reliance on dynamic workplace big data, LinkedIn can provide our country's higher education talent strategy with powerful data and intelligence support."